When I am alone in the kitchen, baking is a cathartic and creative experience. When I am not alone in the kitchen, baking is stressful. I think it might be analogous to how most of us feel about singing (preferring to relegate this activity to the shower or reserving our vocal outbursts for solo car rides). The level of stress brought on by the presence of another person in the kitchen when I was baking this pie was laughable. How many times have I rolled out a pie crust without so much as thinking about what I was doing? How many times have I followed a recipe without ever second guessing myself? Introduce another body to the room, however, and I’m a ball of nerves. Even when the other body is a somebody who is contagiously excited about this pie and who I know will love me despite the outcome of this baking foray… So why the neurosis? I really can’t say. Luckily, this dish-less pie turned out g r e a t and the worst that happened was that a slice slid off the serving plate and onto the floor. Luckily, the somebody I mentioned before is also not afraid of a little dirt, and promptly rescued the fallen piece of pie and ate it with delight as I stood there not sure whether to laugh or cry (laughter won, in the end). What I’ve chosen to glean from the whole experience is that a.) I need to calm down sometimes and learn to trust myself more and b.) that most things are not worth fretting over when it comes to baking, especially when you have someone who’ll eat pieces of your fallen pie off the floor and still love you. Combine flour, sugar, and salt in a medium bowl and mix well. Cut in the margarine using a pastry cutter or two knives scissor-style, until the mixture resembles coarse crumbs (the biggest crumbs should be no bigger than the size of a pea). Drizzle 3 tablespoons of the ice water over the flour mixture, and use a rubber spatula to press together. Add more water, a little at a time, as needed until it is just moist enough to coalesce into a ball. If not using immediately, wrap the ball in plastic wrap and place in the refrigerator. Otherwise, let chill in the bowl (covered) in the freezer for at least 30 minutes. Now prepare your filling. Adjust your oven rack so it’s in the middle position, and preheat oven to 400°F. Wash and pat dry your peaches and strawberries. Hull the strawberries and cut in half or quarters (depending on size) and place in a medium bowl. Slice the peaches about 1 inch thick and add to the bowl (you can peel them if you prefer, but I think they’re just as delicious with the skin on!). Add the sugar, salt, sage, and tapioca flour and mix gently (try to release as little juice as possible from the already-juicy fruits). You want all of the white powder of the tapioca flour to disappear. Remove your dough from the fridge or freezer and roll it out on a well-floured surface. Roll it to about a 9-10″ diameter. Fold in half and half again and transfer to a rimmed baking sheet. Unfold. 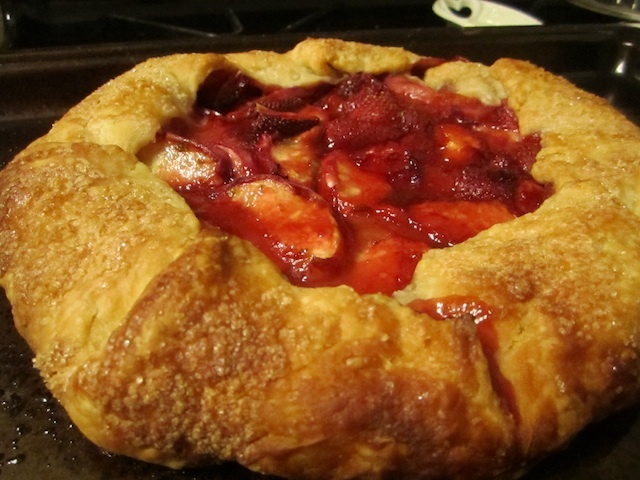 Gently pour the fruit filling onto the center of the dough, leaving about 3 inches all around the edge. Gently fold the edges up and over the filling, pressing down gently but firmly so it stays in place. Brush or sprinkle the milk all over the crust and sprinkle with sugar. 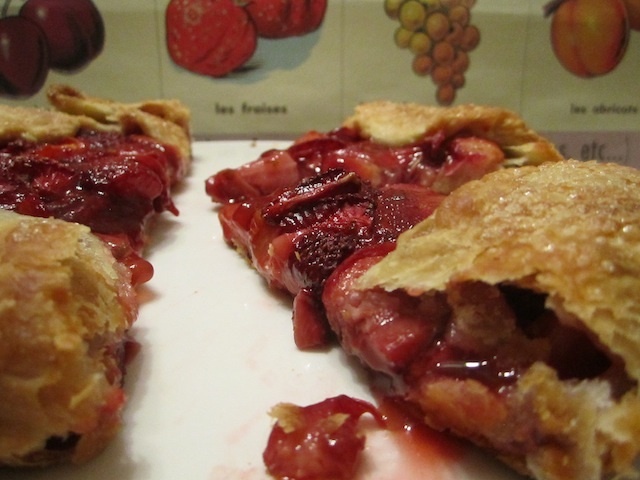 Place the baking sheet with the pie onto the middle rack of the oven. Bake for 25 minutes, then lower the temperature to 375°F and bake for an additional 15-25 minutes, until the crust is deep golden brown. Remove and let cool before serving. A pizza cutter works great for slicing! 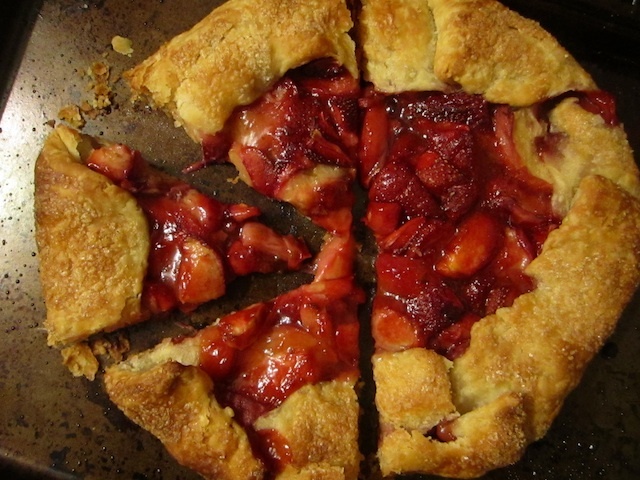 This entry was posted in Pie, Vegan and tagged crostata, peach, sage, strawberry, vegan. Bookmark the permalink. When you a bake, it gets to be a force of habit, no matter if someone is waiting with anticipation or you are baking for yourself! And you did not disappoint ! Nice crostata, I like the combination! !